The symbol of our country's untamed western heritage. 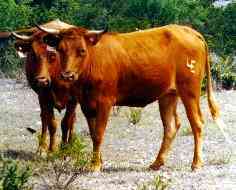 The wide sweeping horns of the Texas Longhorn characterize the dramatic difference between other domestic and imported beef breeds. What makes them unique is that the Longhorn was fashioned entirely by nature, right here in North America. Their ancestors were first introduced to this continent over five hundred years ago by the Spanish army and Catholic missionaries. Over the centuries the breed has been shaped by mother nature through natural selection and "survival of the fittest." Hardy, aggressive and adaptable, the Texas Longhorns were well-suited to the rigors of life on the ranges of our southwestern United States. They survived as a primitive animal on the most primitive of ranges and became the foundation stock of this region's great cattle industry. The Texas Longhorn really seems to thrive in the harsh desert climate close to the Mexican border, here in West Texas where King Springs Ranch is located. We have found that Longhorn cattle do not require any baby sitting whatsoever. Their calves are small at birth so the cows don't need any help calving, and during drought situations they can get out there and make a living without waiting for the feed truck to come along. Calves are weaned at approximately six months and fed in the pen for about 2 months. We sell the calves as yearlings and sometimes lease the yearling calves to roping clubs and stock contractors. When leased heifers get too big for the customer to rope we bring them back to the ranch where they are put into the breeding program. When we get the bulls back we sell them as heifer bulls. If you need cattle to rope or a bull to put on your first calf heifers give us a call. Our spring round-up is in May to coincide with Memorial Day and our fall round-up is in September to coincide with Labor Day. We allow guests who have their own horses to saddle up and make a hand when we work cattle. If you would like to participate in a sho-nuff Texas cattle round-up you're more than welcome. The works take about four days and the cost is $500 per person with meals and lodging provided. All cowboys and cowgirls must furnish their own horses, tack and feed. BYOB and BYO guitar too because we've been known to pick and grin a little. There are ten miles of dirt road between the highway and headquarters and most of it is pretty rough so no foreign cars are allowed. Except for Toyotas with a whole lot of clearance.